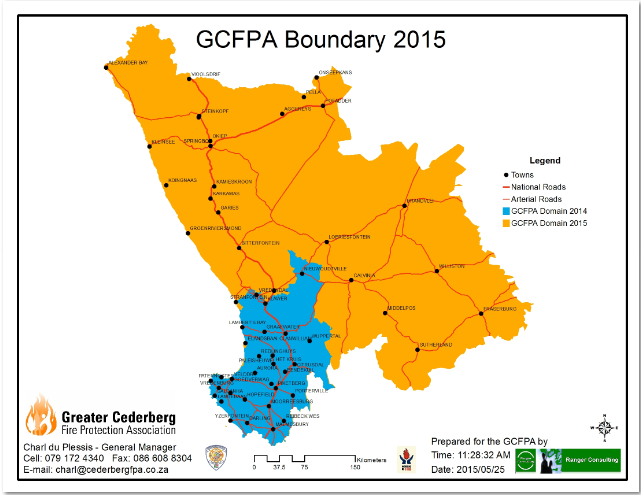 The Greater Cederberg Fire Protection Association (GCFPA) helps landowners to prevent, manage and suppress wildfires by practising Integrated Fire Management (IFM). We aim to protect lives, livelihoods, property and the environment. We serve the entire West Coast District Municipality, Namakwa District Municipality and some areas of the Cape Winelands District Municipality ( Witzenberg Municipal areas). Click here for a map. The National Veld en Forest Fire Act, (Act 101 of 1998) places certain responsibilities on the landowner from whose properties the possibility exists that a fire may start and spread. The Act makes provision for the establishment of a Fire Protection Association (FPA). The GCFPA was registered in 2005 according to the Act. Our GCFPA experts help you to compile Fire Management Plans to minimise the fire risk on your property. This plan will also assist you to comply with the Act. In a court case, an FPA member is not presumed negligent should a fire start on his or her property and spread to cause damage elsewhere. The plaintiff has to proof negligence at his cost. If you are not a member, you are considered negligent and have to prove your own innocence. The FPA organises and co-ordinates members during fire-suppression operations. Trained and equipped teams are available at a minimum cost to assist in fire prevention, e.g. preparing fire breaks, conducting controlled burns and fuel reduction operations (alien invasive plant species clearing), and fire suppression. We communicate with our members regularly to improve fire awareness and to help prevent accidental wildfires. We offer a variety of subsidised training and capacity-building courses to members and their staff. We assist members to apply for exemption to move firebreaks away from property boundaries. Institutions like RSA Agri, Agri Western Cape and insurance companies support, and in some cases require, active participation in an FPA. HACCP, GLOBALGAP and IPW accreditation requires membership (membership certificates are available on request). The GCFPA is not a fire fighting organisation.Fire suppression services is the responsibility of various District Municipalities. It is important to contact the Fire Brigade Services of your District Municipality in a emergency situation.